Stipple engraving by Victor Marie Picot (1744-1805) after a painting by Charles Jean Robineau. The engraving was better known than the original painting which was probably commissioned by George IV and is in the Royal Collection. This famous exhibition fencing match took place on 9th April 1787 at Carlton House in the presence of the Prince of Wales and Mrs Fitzherbert. D’Éon’s opponent was an almost equally exotic figure, the mulatto Chevalier Saint-George, intimate of the duc d'Orléans and virtuoso of both violin and épée. According to the Reminiscences of fencing master Henry Angelo, "the Prince of Wales was much gratified at the performance, and smiled at the violent noises of St. George during his attacks, which resembled more the roaring of a bull than sounds emanating from a human being!" 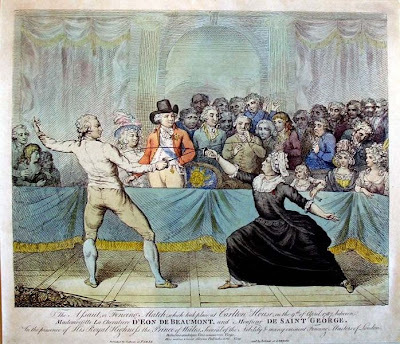 Despite being seventeen years the elder and hampered by his petticoats, d’Éon trounced his bellowing opponent, hitting him seven times without being touched. 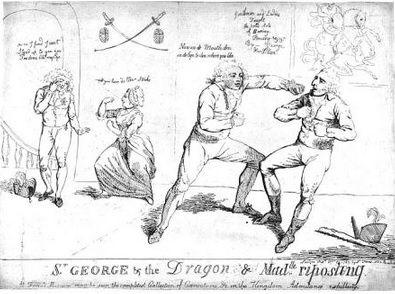 The occasion later inspired a 1789 Isaac Cruikshank cartoon against the Prince of Wales which inverted the legend of George and the dragon by having Prinny and his rakish sidekick Major George Hangar soundly thrashed by a "maid" (d'Éon) and a "dragon" (Saint-George, a former dragoon). Postcript to Chevalier d'Eon and his Worlds edited by Simon Burrows et al. (2011) - previewed on Google books or Am﻿﻿﻿﻿azon.